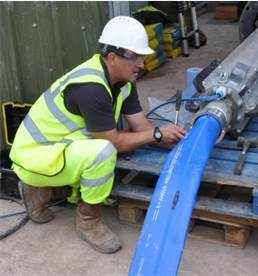 WELLMASTER 400 is the premier, Flexible Rising Main system for use in ground-water extraction. It is manufactured from high tenacity synthetic yarns, circular woven and totally encapsulated in a tough high performance elastomer. The riser has an integral textile reinforced rib for location of the power cable strapping system.